Do you wish you had more confidence to pick investments? Would you like to be less reliant on the opinions of others; to feel more in control of your performance. SharePad is designed to give you this confidence. 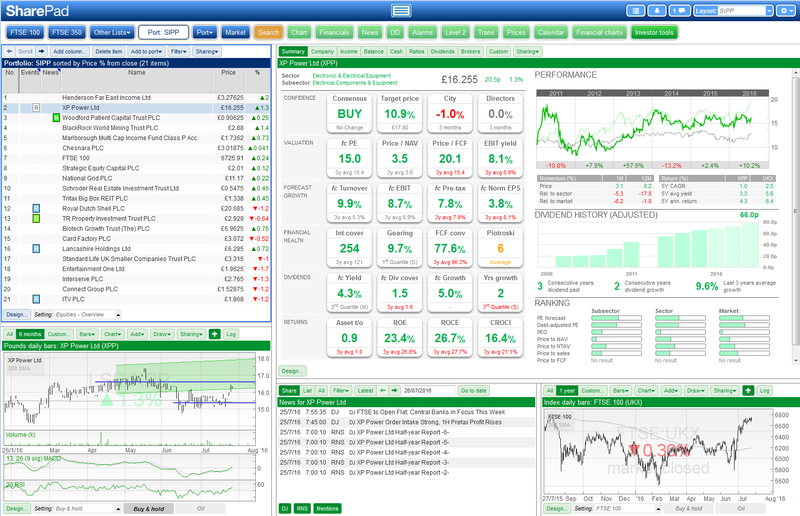 Described as "a Bloomberg terminal for private investors" by MoneyWeek and voted the UK's Best Investment Software 2016 in the FT/IC awards, SharePad is the essential toolkit for the serious investor. So you've come across a stock - maybe you read about it in the press or it came up in a stock screen. Now what? 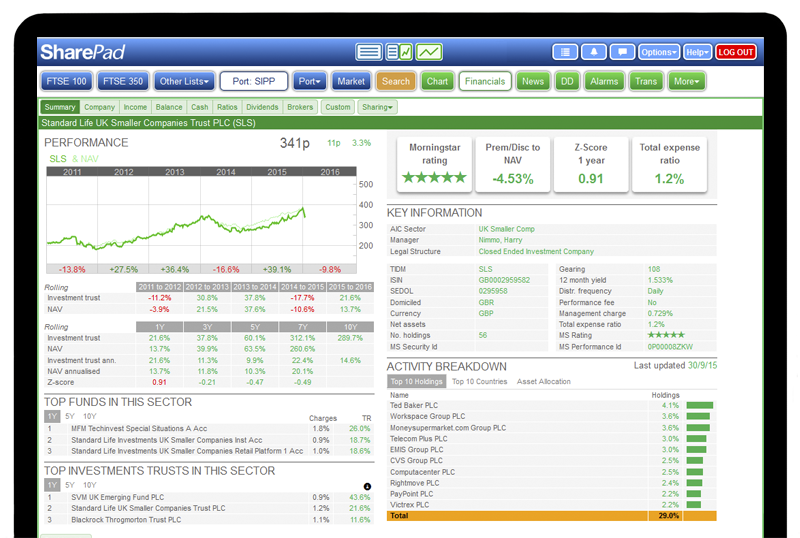 Your first stop is SharePad's unique Dashboard which highlights a company's strengths and weaknesses at a glance. We've picked 24 measures which provide a thorough analysis of sentiment, valuation, growth, returns and financial safety. The traffic light colouring system gives you a clear visual guide - lots of red, steer clear; lots of green, investigate further. 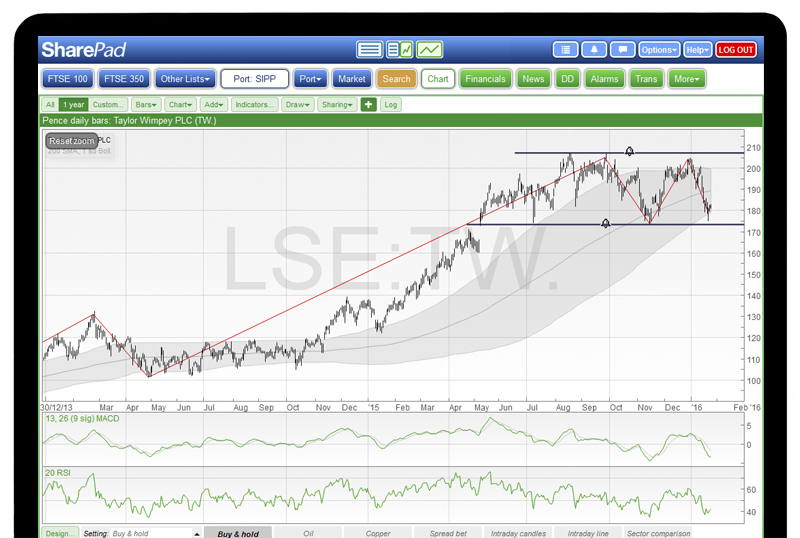 Click here to see more superb stock analysis tools and features. Once you've identified a stock for further investigation, SharePad's Carousel walks you through the key financial characteristics of each share in more detail. Around 20 financial charts arranged on four tabs - Key data, Quality, Safety and Valuation - are accompanied by guiding text from Phil Oakley. The carousel is designed to help you learn the key questions to ask and how to interpret the data. You'll learn how to spot tell-tale trends which could signal future trouble. We believe that the key to investment success is understanding what you are buying. 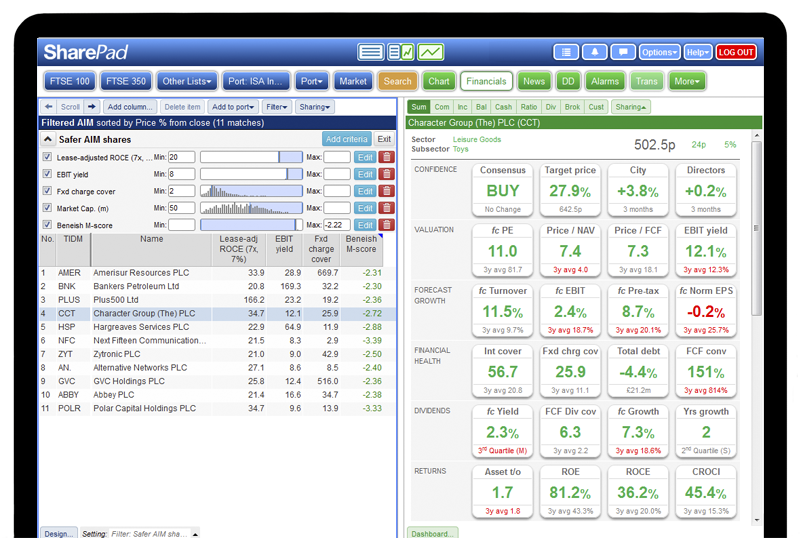 SharePad's superb Dashboard and Carousel will help you become a more successful stock-picker. Filtering, or stock screening, enables you to search the stock market for companies that match specific criteria - in seconds. You only need a limited understanding of financial results and ratios to start finding shares with attractive characteristics. Click here to read more about SharePad's powerful filtering. Our aim is to make investment research fast and easy. 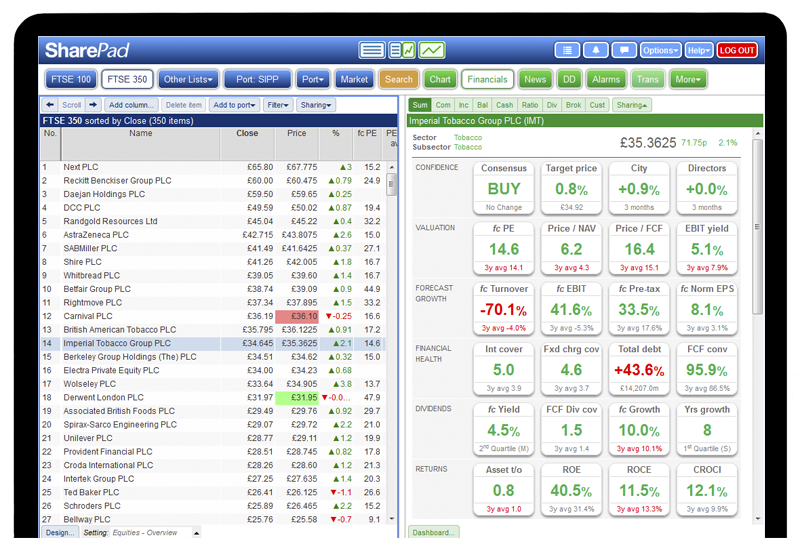 SharePad's flexible split-screen format means that you can scroll down a list of shares on the left hand side of the screen and see the chart or financials for each stock on the right hand side of the screen. 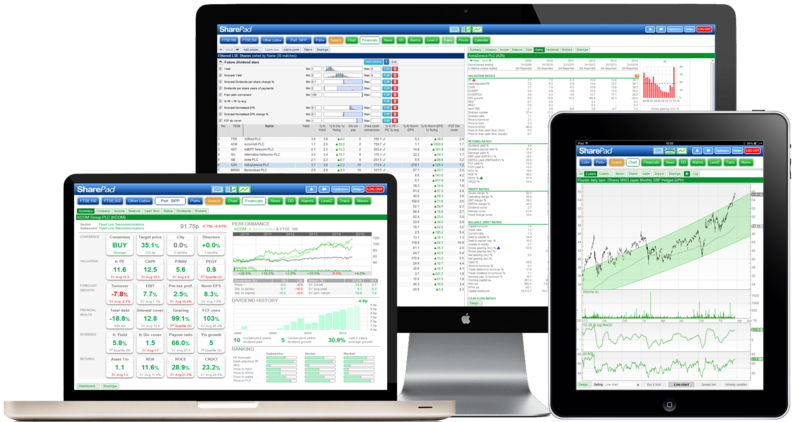 Now with customisable multi-window layouts, SharePad enables you to create data-rich workspaces for your investment research, portfolio management, stock screening and trading. Click here to see an example. Many investors diversify their portfolio by investing in foreign markets and alternative asset classes like bonds and property. SharePad includes information on funds, investment trusts, exchange traded funds (ETFs) and retail bonds so you can decide which offer the best value for money. Why do broker accounts offer so little information on your performance? SharePad's portfolio tools give you much greater control. Create portfolios containing all your investments - shares, funds, investment trusts, ETFs and bonds. Record all your transactions including costs. 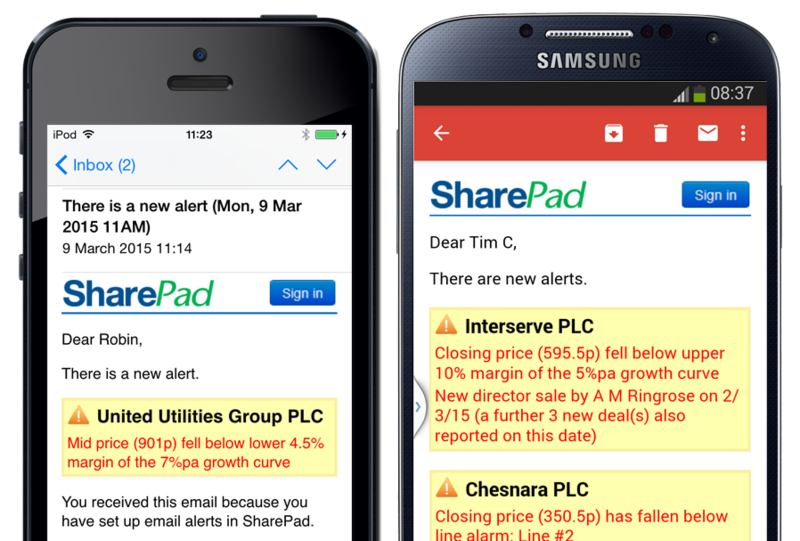 SharePad will automatically record dividend payments for you. 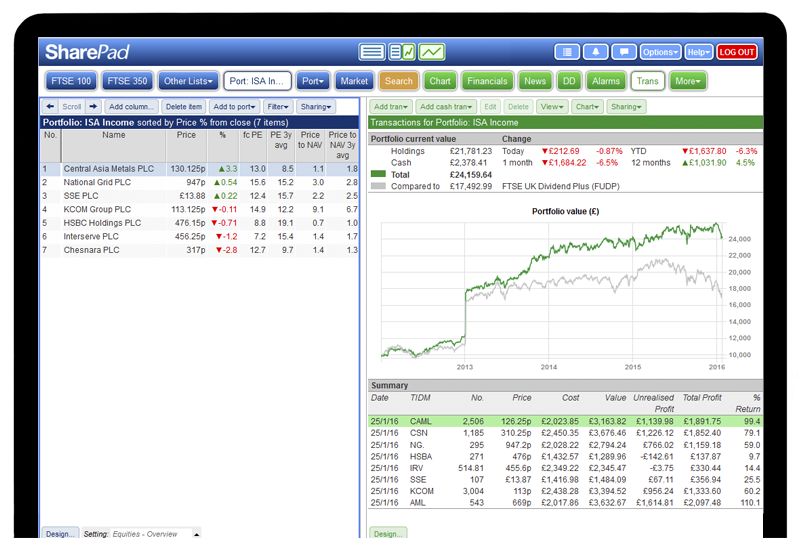 Choose a suitable benchmark index for each of your portfolios and monitor your performance on your portfolio chart. Click here to discover four ways SharePad makes it easier to manage your portfolios successfully. 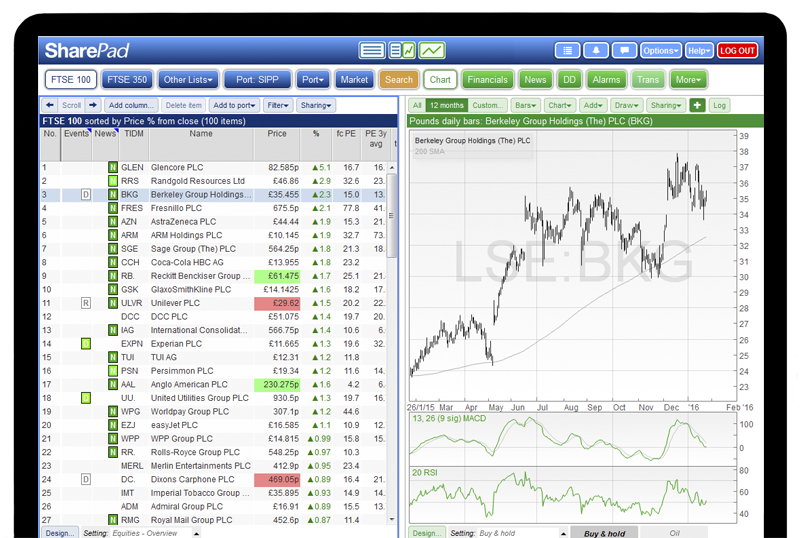 If you are investor who keeps a close eye on chart trends, or trades via a spread betting account, you'll love SharePad's charts. From simple momentum indicators to advanced analytics like Fibonacci retracement, Ichimoku, and Point & Figure, SharePad enables you to create multiple chart views which you can switch between with a single click of the mouse. 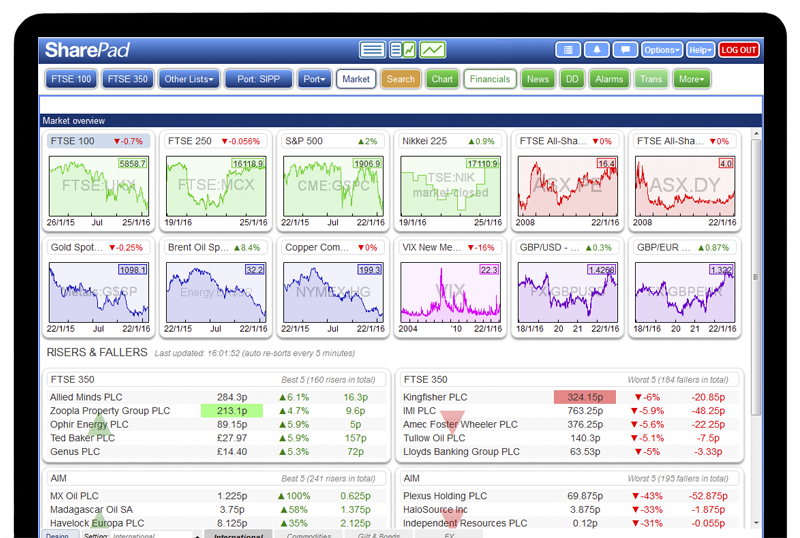 SharePad includes a broad range of market data - UK and US shares, global indices, funds, bonds, commodities, currencies and economic indicators. Our Market Overview provides an easy way to see what's happening around the world - a great place to start first thing in the morning. You can customise this view to display the information you are most interested in. For example, add the top risers and fallers in your portfolios. To save you having to check your investments all the time, SharePad lets you set alarms to inform you of unexpected price movements and events that could affect the value of your investments (e.g. 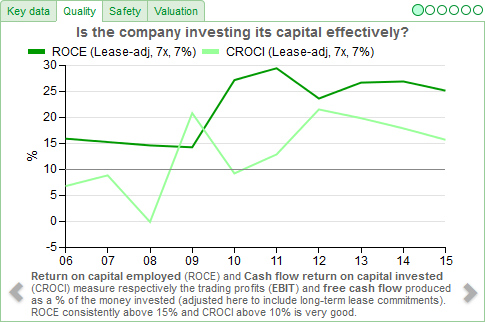 news stories, a reduction in profit forecasts, directors selling shares). Receive alerts on your phone via email so you can react quickly wherever you are. Click here to read more about alarms. 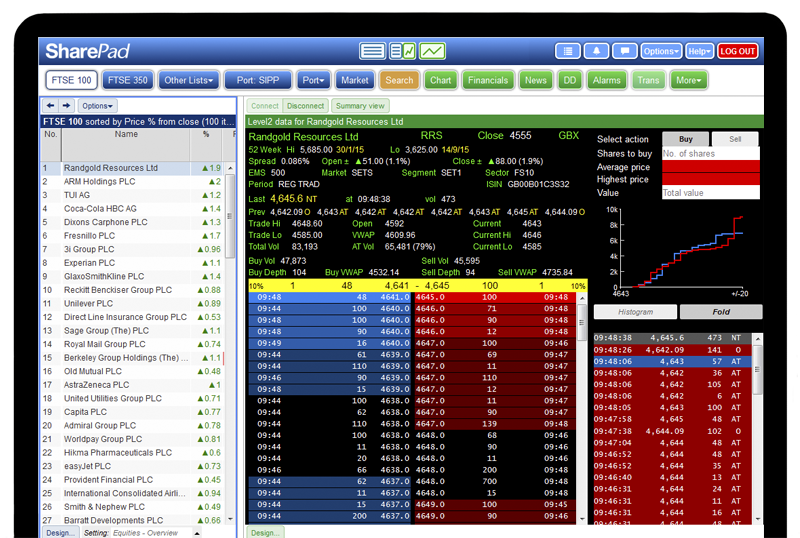 Our real-time service, SharePad Pro, includes Level 2 for the London Stock Exchange. Our smart Level 2 display includes a summary order book, VWAP calculator, order volume graph and trade list as display options. Whilst other companies route your support queries abroad or only respond by email, our friendly London-based customer support team is dedicated to helping you get the best out of SharePad. We actively encourage customers to call as often as they like. Don't worry if you find all this investment jargon a little daunting. Our aim is to help all customers become confident and successful investors. Our resident analyst Phil Oakley worked for leading City institutions and spent 3 years as senior investment writer for MoneyWeek before joining us. Phil's Step-by-Step Guide to Stock Analysis and weekly articles will teach you everything you need to know. If you want to be able to pick winners, start by choosing the best investment tools. Thanks to compounding, incremental improvements in your investment decision-making should make a huge difference to your lifetime gains. Customers tell us that their performance gains and cost-savings far exceed the subscription price. &ast; Daily means after market close (e.g. 6pm UK); delayed means 15 minutes delayed. &ast; Some global indices are daily or delayed.